The Cloud Foundry Summit Europe is one of two official conferences concerning Cloud Foundry, Bosh and Concourse, which took place in Basel for the second consecutive time this year. As a bronze sponsor of the event we were thrilled to be a part of this amazing conference. We made our way to Switzerland as a team consisting of seven engineers. Our goal: give six talks, lead two tracks, learn, network and defend our title as CF-Summit Europe Hackathon winners in 2017. So the stakes were high this time. Arriving at the Congress Center Basel on Wednesday before the official opening of the conference, our crew split up for the Hackathon: Christian Brinker, René Schollmeyer, Jannik Heyl and Benjamin Gandon (Gstack) teamed up on the Bosh-Central project, a centralised Package-Manager for Bosh. Driven by the frustration of managing packages by hand when creating releases, the team came up with an NPM-Like solution, except for one mature difference: users should be able to upload their custom-built packages to the service. Whenever another user is looking for a package he has the choice between several versions of the package from different vendors, which enables him/her to choose the package he/she has the most trust in. The user interacts with the service via a CLI. It handles the correct uploading procedure as well as the download. An important part of the packaging in Bosh Releases are dependencies. Bosh-Central gets you covered with that as well. When uploading a package, the CLI automatically uploads the dependent packages as well and builds up the tree. Whenever a user downloads a package, these dependencies also get resolved. The team builds a working prototype with a CLI, a backend service and an Angular Dashboard (that displays all available packages and their dependencies) as part of the Hackathon. Bosh-Central has a huge potential to help engineers speed up the process of building Bosh-Releases. Not only has it the potential of being a huge timesaver, it could also increase the number of available Bosh-Releases and therefore make Bosh even more attractive to operators. This is why we could proudly say: we did it again. 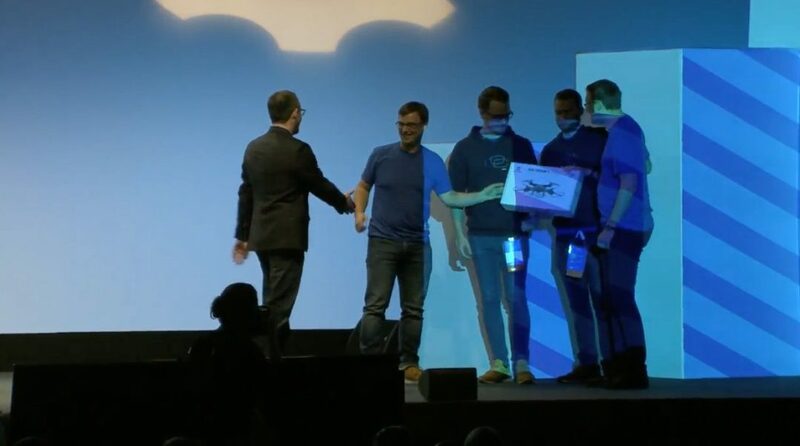 For the second consecutive time we won the Cloud Foundry Summit Europe Hackathon. You may ask yourself if we are continuing our work and Bosh-Central, and we are happy to say: yes, we are! Our engineer Johannes Strauß took over the project and has been working on it since then. If you are interested in the future of Bosh-Central, stay tuned. Finally, I have to thank our colleague Ben from Gstack and my evoila team. It was a pleasure to work with you!